Maximize your space with this corner bookshelf, which features two open shelves to display your favorite book collection and decorative items. Combo Bookcase And Storage Case. Natural Finish. Easy To Assemble. Details: (Wide) 32 In. x (Deep) 11-1/2 In. x (Height) 31-1/2 In. Complement your home or office decor with this Black and Decker wide multipurpose alder storage cabinet with frosted panel doors. Two Door Storage Cabinet. 2 Doors, 4 Shelves Storage Cabinet For Kitchen, Bathroom, Bedroom And Laundry Supplies. Bookcase with storage. Natural finish. Easy to assemble. Details: (Wide) 20 In. x (Deep) 11-1/2 In. x (Height) 47 In. Tall White Utility Closet. Easy To Assemble. Dimensions: 55L. X 24W. X 12H..
Linen Metal Cabinet-Free Standing. 4 Shelves. Available In Color White, Almond, And Black. Fully Assembled.Size 64 H x 12 D x 18 W.
Linen Metal Cabinet-Free Standing. 4 Shelves. Available In Color White, Almond, Brown And Black. Fully Assembled.Size: 64 In. (H) x 12 In. (D) x 24 In.(W). Combination Metal Cabinet. Available In Color White Only. Fully Assembled.3-1/2 Shelves. Size, 64 H x 12 D x 18 W.
Combination Metal Cabinet. 3-1/2 In. Shelves. Hook. Available In White Color Only. Fully Assembled. Size: 64 In. (H) x 12 In. (D) x 24 In.(W). *Local Delivery Or Store Pick Up Only. Click Here For Delivery Areas. Storage Metal Cabinet. 4 Shelves With Locks. Size, 64H x 20D x 30W. Available In Color White, Almond, And Black. Fully Assembled. *Local Delivery Or Store Pick Up Only. 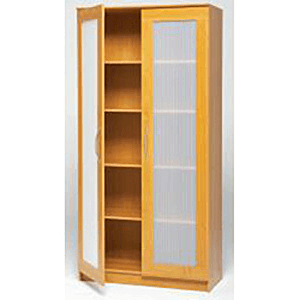 Sliding Door Cabinet In White Finish. Ideal Where Space Is A Premium And There IsnÃt Enough Room For Swinging Doors, The Sliding Door Cabinet Has Four Fixed Shelves, Eight Sliding Doors And A Large 4 In. Kick For Extra Stability. At 16 Inch. Deep, It Is A Great Solution For Toys, Pantry Items Or Laundry Products. Can Be Used As A Stand-Alone Storage Solution Or Combined With Other White Pieces To Become A Feature In Any Bedroom. Strong Construction. Easy To Assemble. Size: 30 In. (W) x 16 In. (D) x 60 In. (H) Weight: 87lbs. Business Storage-(Metal)Commercial Grade. 4-Shelves, 2- Locking Handles. Available In Color Almond, Grey, And Black. Fully Assembled.Size: 72 In. (H) x 20 In. (D) x 36 In.(W). *Local Delivery Or Store Pick Up Only. Click Here For Delivery Areas.